GOM Audio is a handy and reliable application designed to provide users with possibilities to play audio files in a modern and comfortable media environment. The list of supported audio formats includes MP3, OGG, M4A, WMA, MID, WAV, FLAC, APE, PLS, to name a few. In addition, it can handle CD content and Internet streams as well. GOM Audio is completely free to download, install, and use for as long as you want. No strings attached. 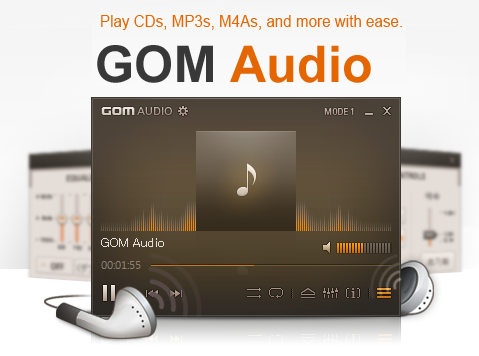 GOM Audio was designed to be the audio playback answer to thepopular GOM Media Player video playback software. Because GOM Audio is based on GOM Media Player, many of the same features (like A-B Repeat and Playback Speed controls) and shortcuts are included! Several popular internet radio stations come pre-loaded for convenient listening, and just like GOM Media Player, GOM Audio can open and play streams of live broadcasts from all over the world that are hosted online. Automatically shutdown, restart, or put your computer to sleep when your playlists reach the end. Fall asleep while listening to music without worring about your PC being on all night! It doesnOCOt take much to run GOM Audio, so you wonOCOt need to close other programs or micro-manage your resource usage in order to play your music smoothly. You can also use GOM AudioOCOs Mini Player mode to lock playback controls to the taskbar for easy access and reduced clutter on your screen. GOM AudioOCOs default skin has 3 different display modes to choose From, and you can change your skin entirely by choosing a new one from the preferences window.